Nike Air Zoom Pegasus 32 are neutral cushioned running shoes. The Nike Air Zoom Pegasus 32 is the 2015 summer edition of one of the most popular running shoes available on the market. Good cushioning and improved fit makes it suitable for both long distance racing and fast workouts. 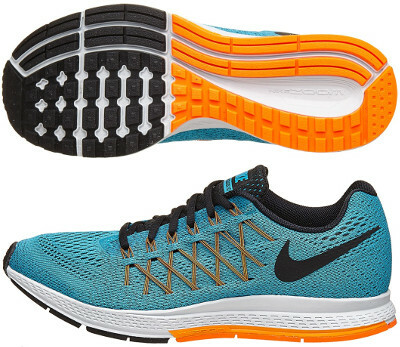 Current version takes advantage of firm cushioning from it predecessor the Pegasus 31 through Cushlon foam in the midsole combined with Nike Zoom Air crash pad in the heel. An engineered mesh upper provides more ventilation featuring a new secure, comfortable fit with Flywire cables wrapping midfoot. Definitely the Air Zoom Pegasus 32 is one of those shoes that everyone "must have" at least once to call him/herself a runner.